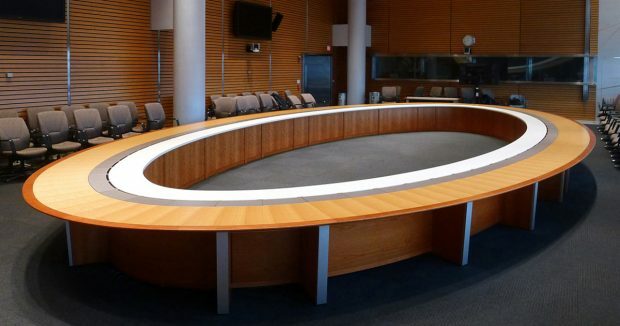 Does the Shape of a Conference Table Really Matter? Whether it’s for a meeting, a presentation, a pitch, or a lecture, conference rooms serve a single purpose: to bring people together. So can the shape of the table that’s in the conference room really matter? Yes, it can. The lines and curves of different shapes can actually evoke psychological feelings. Softer shapes, such as circles and ovals, are known to promote feelings of friendship, support, and care, while sharper shapes like squares and rectangles promote strength, power, and balance. The shape you choose may depend on a variety of factors, including your company’s industry, its type of employees, and the actual purpose of the conference room. For example: If the conference room is a place where employees meet clients, you may want to choose a softer shape to invoke trust. Or, if the conference room is where decision-making board meetings are held, you may opt for a square or rectangle. When deciding on a conference table, keep the emotional aspect in mind. Even though a conference table is just a piece of furniture, its shape can have an effect on the events that unfold in the room. When it comes down to it, the size and shape of your conference room will have a major influence on what kind of table you choose. Size can affect the room’s overall atmosphere; a table that’s too big will make the area seem crowded and uncomfortable, so it’s important to choose a shape that allows enough space for easy movement and gives individuals at least one foot of personal space at the table. From a design perspective, the shape of the room may also help you decide which table shape to choose. While it’s ultimately a personal preference, many people opt for a table that mimics the shape of the room (a round table for a round room, a rectangular or oval table for a rectangular room, etc). Give us a call and talk to one of our design professionals. 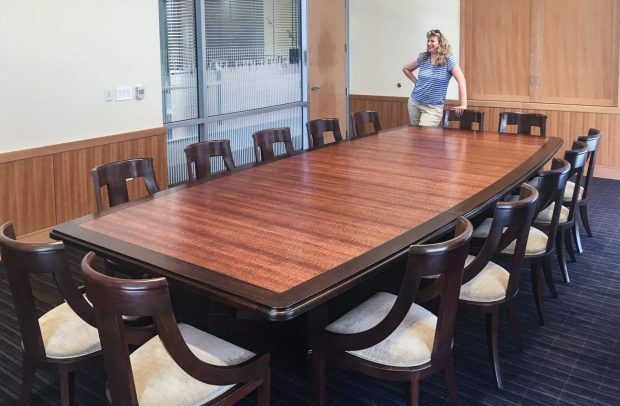 We’ll help you decide which conference table is right for you and your company. This entry was posted in Design and tagged custom conference tables, conference table, conference room tables.